â€¦ or is it just showing off its fanciness to the other nine toes? I went to the annual Marching Bandâ€™s Big Beach Bash and Silent Auction Friday night, held at an indoor beach volleyball facility. (Yes, I know! How cool is THAT!!) And this is how my pinky toe looked Saturday. Guess how I hurt it? BTW, marching band parents DO have all the fun, just in case you were wondering, but, as my daughter pointed out, it brings new meaning to the Bash! Hint: the correct answer involves at least two of the above activities. This entry was posted in Goofy Stuff, Marching Band and tagged Becky Clark, broken toe, February beach party, marshmallow shooters, what's brown and sticky? on February 23, 2009 by Becky. Anyway– what shoes were you wearing? Methinks someone nailed you with their foot and you were too dru– um, too HAPPY to notice. That’s my theory! Sounds like it was fun, and I commend you on taking one for the team. It’s that true team spirit…that willingness to sacrifice your body for the marching band parents! And I’m sure drinking was just a side note to the festivities….no direct connection to the injury….right? Not my responsible, role model of an aunt?? Just because doctors can’t do much for a broken toe doesn’t mean you should ignore it. There is danger of infection, bone marrow leaking into the blood stream- fun stuff like that. If nothing else, it’s a great excuse to get some vicodin. I’m up for the challenge – if only to make the pain more worthwhile to you and get you more blog responses! Am guessing that you were still in a good mood while walking to the car, laughing, but in sandals on slippery snow/ice. Cause if you had injured your toe earlier in the event, it would not have been all that fun! There is no pinky toe, there is no bruise, this is all a very bad dream, you’re all avatars, and you owe ME a beer (were I to drink, I don’t, but we’re all avatars)…. You were double-dipping the guac, not noticing that you were near the strike zone in beach volleyball and you got hit. You didn’t notice because you were too dru- I mean HAPPY to notice. Dad shooting marshmallows? Difficult to picture. Oh my God, I don’t really care about winning the contest (yes, unusual for me) because I am too busy laughing at the STICK JOKE! That is sooooo awesome and I am totally stealing it as MY new favorite joke that my kids will hate. So I guess I have purple pinky to thank for that. Gosh, Claudia, if you liked that, here’s another one. What’s red and resembles a bucket? ……. a red bucket! Don’t break your toe laughing too hard. I’ve decided it’s probably not broken, but I still haven’t seen a medical professional. Except my son, that is, who has his EMT certification AND a copy of Grey’s Anatomy … the medical guide – not the tv show. 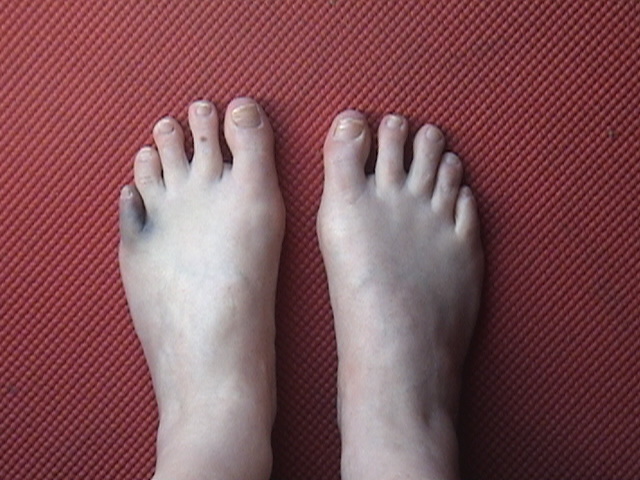 It’s quite fascinating, really – the multi-hued bruise is migrating across the top of my foot, looking oddly like a kindergartner’s fingerpainting. But with toes. I’m curious as to how many people revisit posts to read comments that might have been posted after theirs. Plus, my feelings are bruised – but not as badly as my toe – that everyone isn’t clamoring to know the specifics of how I hurt myself! I mean REALLY! Where’s the love, folks?! So, unless someone specifically writes a comment that asks …. I ain’t telling! We all just thought you were starved for attention and had just applied a heavy dose of foundation and various shades of mascara to mask your inner pain. Your cry for help. A reason to blog. I’ve heard of “cutting,” but I guess your issue is “bruising.” But, now, hey–not entirely fair, given I had e-mailed to ask on the status of your toe and if it really was broken. But I see you are still yearning for more cries for attention! Note your “plea for sympathy,” above! Oh, Becky, you are SO transparent! As to a response for you return to read comments, I don’t typically do so (I noted a couple posted to my own blogs MONTHS later…). In fact I’m not even really doing so now–it’s just a coincidence I’m here. Replying to a comment on a previous posting. Well, first, FP … I’m QUITE offended that you thought my foot was my face and that my toe was my eye. Second, I’m a writer … I beg for attention every minute of every day. Duh. Just like you. And, third, it wasn’t a coincidence you just happened back on my blog today. I pulled you into my karmic universe using only a blue Bic pen, a band trip permission slip, and the extraordinary power of my mind. When I lock on, people are helplessly in my control. Now bring me cake. You KNOW my story…I was too wrapped in the stick joke to care the details of the toe breakage. Sigh. Tell me Becky–what happened? 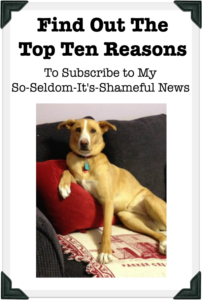 FYI, if I leave a comment, I subscribe to see what other people say! It’s cool. Claudia … THAT’S what I was wondering! Very cool that you get the comments from anyone else. And since you asked so nicely, here’s the scoop on my toe, even though you’re just being polite. No breakage, according to my chiropractor who bonked it with one of his torture devices and afterward told me if it had been broken, he’d be peeling me off the ceiling. All of which resulted in me doing that dance-walk thing (you know the one – where you want to keep dancing, but your partner doesn’t?) barefoot from the dance floor across the uneven sand where I proceeded to drive my toe into a chair. Don’t you feel better, now that you know? FYI, it still hurts and the bruise is marching across the top of my foot toward the Little Piggie Who Went To Market. Thanks for the outpouring of concern. I love you all with the white-hot intensity of ten thousand suns. On Feb 23 at 9:41 pm, Claudia said, “I donâ€™t really care about winning the contest.” Six short days later she thinks she wins something?! And I don’t even see where she made a guess! So, yes. Yes, Claudia, you win. By your sheer audacity, you win. You can choose to buy me a beer or to never see photos of my feet again. Priceless spoils … all yours. Hello I think I really broke my pinky toe is it true DR. Can’t do anything? What do u recommend it hurts do much! My toe looks really similar right now! So what did you in? The drinking, dancing, sand or ice? Yes, Gretchen. Exchange “ice” for “table leg” and I think you can picture it perfectly. Hope yours feels better soon! So it wasn’t broken in the end. How long did it take to clear up and is it all OK now? I stubbed my toe pretty hard recently and the top of my foot was swollen, now it’s only a little bit swollen but the toe has bruised up. I don’t like bruising as it implies dead cells that are slowly exiting the premises to me, and on the foot, the lowest and furthest away from the heart I don’t like it. It’s day 3. It feels better each day, I can walk on it and bend it (though I don’t bend it in order to let it heal). Anyway the sight of bruising I don’t like, especially the dark parts. Let me know! Chris … I don’t remember how long it took to get all better. If you can bend it and walk on it, though, I think you’re probably in good shape. Good luck! Thanks anyway, it’s taken a week so far but the swelling and bruising has gone down. Think I’ll be OK. Cheers!